This guest post is written by Katherine E. Reilly Mitchell, who is an assistant for a website about single mothers and also CollegeGrantsandScholarships.org, which provides help for potential college students. She also maintains a personal blog at humantextuality.com. It's so easy to set lofty goals when one has a baby on the way. In the months before my daughter was born, I planned to be the mom that read to her baby every day and had wonderful music playing 24-7. Of course I could easily fit these around freelance work, vegetarian cooking, breastfeeding, cloth diapering and some exercise. After the baby came, I had a few blissful weeks of no work, disposable diapers and gifted meals. Music and reading magazines aloud during feedings were top of the list, and I was feeling very successful at exposing my daughter to smart habits and diverse culture. Then we transitioned to cloth diapers and I started working again. I managed to read to the baby most days, but at some point I realized that I wasn't playing music. I was even forgetting to sing. How does someone who often sings to herself forget to sing to her infant? I was most certainly robbing my child of cultural roots and probably some math skills. Adding “music time” to our already full schedule was not an option. I needed to plant music in the house so that it would occur organically with certain activities. 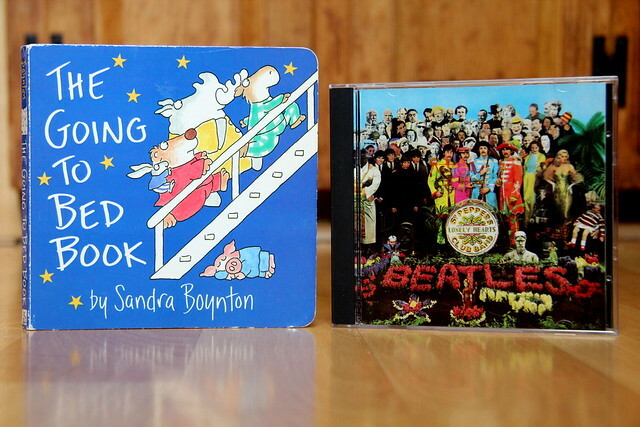 I put a CD player in the nursery and grabbed a few discs I like – selections including Bach, Enya, The Beatles and Mozart. Each morning, I set a CD to repeat and walk away. Now, every time we enter the nursery we're accompanied by great music. I also keep Pandora up on my laptop, ensuring that my daughter will recognize the culturally significant sounds of Pearl Jam and Gaelic Storm. Reading, as I mentioned, was easier. The problem was that I was reading the same books over and over. Like music, reading material needed to be placed around the house. With a book diaspora reaching the living room bookshelves, dining room table, nursery and master bedroom I can squeeze in quick reads all day long. We also made Sandra Boynton's (I'm a big fan) The Going to Bed Book part of the bedtime routine. It's important to me to expose my baby to music and literature that I like. While I definitely want her to be well rounded and develop her own interests, I know I'll be more enthusiastic about things I actually enjoy myself. Besides that, I think I have decent taste – might as well share it. Plus, I absolutely cannot tolerate those “kid” compilations with annoying songs and yell-singing. Until my daughter can verbalize her desire and preferences for books and music, it's up to us as her parents to get her to a place where she knows to ask for them. I believed that before she was born and I hold to it now, despite the challenges involved. The key is to not over-think it and use the resources on hand. In the meantime, I'm going to enjoy listening to the music of my choice, until my child decides that it's the epitome of uncool and never removes her earbuds.